Fleming was born on August 6, 1881, to a farming family in Lochfield, Scotland. Walking four miles through the countryside each day to attend school, he developed an early interest in the natural world. He ranked consistently at the top of his class, but poverty prevented him from going to college immediately after high school. He worked as a shipping clerk for four years and, at age 20, he began medical studies. Fleming earned a medical degree at St. Mary’s Medical School in 1906 and began research at London University. He studied bacteriology at that institution for the rest of his career, excepting several years service in the British military medical corps during World War I. His goal was to find a safe and effective substance for treating diseases caused by infectious organisms. About 1921 Fleming cultured a sample of his own nasal mucus and noted that it destroyed a colony of bacteria growing on the same dish. He dubbed the bacteriakilling substance in the mucus “lysozyme” and subsequently found that it is present also in blood serum, tears, and saliva. Lysozyme dissolves bacterial cell walls, thus preventing some infections, but it is not effective against most disease­causing organisms. However, the evidence that natural secretions could kill germs inspired him to search for other plant or animal substances that might help the human body fight infectious diseases more effectively. Fleming made his major breakthrough in 1928, observing that a mysterious mold had contaminated a plate of the bacterium Staphyloccocus aureus, an infectious agent. The mold appeared to have inhibited bacterial growth. Fleming isolated the antibacterial substance in the mold (identified as Penicillium notatum) and called it “penicillin.” Further investigations showed that penicillin kills many infectious bacteria and leaves human tissue unharmed. The circumstances that led to Fleming’s discovery were extremely improbable. The mold and the bacteria require particular conditions to grow, and it was only because of unusually damp weather in London in 1928 that the organisms ended up inhabiting the same plate at the same time. But Fleming’s trained eye noticed the anomaly and his persistence in studying the effects of common bread mold not only resulted in discovery of a natural healer but also confirmed his idea that antidotes to infection are produced by many species. Fleming found penicillin unstable and difficult to purify. Fleming’s discovery remained obscure until 1940, when chemists Ernst Chain and Howard Florey developed methods to purify, preserve, and mass­produce penicillin. The medical community soon recognized the potential of this new drug for fighting disease. 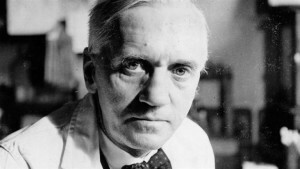 Fleming was knighted in 1944 and, in the following year, Fleming, Chain, and Florey shared the Nobel Prize for Physiology or Medicine. Fleming retired in 1948 and died in London on March 11, 1955. By introducing antibiotics to medicine, Fleming’s discovery significantly reduced the spread of infectious diseases in the twentieth century. His ideas also prompted others to look for antibacterial, antifungal, and antiviral agents that would improve human health. Streptomycin, chloromycetin, and tetracycline are some of the successes. Prior to the discovery of penicillin, only a few substances were known to have antibacterial properties, and they produced toxic effects within the human body. After Chain and Florey devised a means of purifying and concentrating penicillin, large­scale clinical trials were begun to test the new drugs efficacy. By 1942, the trials had been declared enormously successful, and penicillin had been established as a wonder drug for many infectious diseases. Penicillin was immediately—and still is—used to treat pneumonia, scarlet fever, gonorrhea, diphtheria, meningitis, strep throat, and various wound infections. Although Fleming is remembered mostly for his discovery of penicillin, his earlier work has also been influential. The enzyme lysozyme has become a valuable research material used to break apart bacteria for chemical analysis.